When you take three seasoned veterans like Assif Tsahar (tenor sax and bass clarinet), Mark Dresser (bass) and Gerry Hemingway (drums) and give them an hour to produce creative, freely improvised music, you know the results will be worthwhile. This performance is a live recording from 2011, and it’s an excellent example of what happens when three gifted improvisers mutually combine their talents to produce music that manages to be both challenging and highly engaging. Tsahar is dynamic and wide-ranging in the emotional arc of his playing: whether offering piercing cries and squeals (especially prominent on the record’s fiery closer, “Divided Layers”) or more languorous, mysterious passages (as evidenced on his bass clarinet playing on “Oblique Interpretations”), his intensity and relentless passion are always present. But in many respects the record really works so successfully because of the distinctive rapport between Dresser and Hemingway. Their ability to anticipate and respond to each other’s shifting tempos and rhythmic directions makes each track consistently surprising and, at the same time, cohesive—a truly impressive feat when it comes to free improvisation. A great example of the trio’s empathetic conversation is on the record’s first track, “Comprehensive Passage.” It starts fairly unobtrusively, with quiet, reserved drum work from Hemingway and a subtle but infectious ostinato phrase from Dresser. 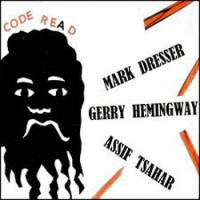 Then, by the time Tsahar joins in with long, pleading statements, Hemingway begins to punch in with more insistent commentary on the snare drum—by which point Dresser has also become a more percussive presence as well. And once we’re halfway in, Tsahar is blowing with abandon, with Hemingway and Dresser surging with dramatic, explosive power. A track which starts with the three musicians tentatively searching to find the piece’s identity results in them gradually discovering it—with a vengeance—and by the end of the track’s almost ten minutes, it feels like we’ve just experienced a tightly structured, well-crafted piece of music, despite the spontaneous, unpredictable twists and turns that we’ve encountered along the way. A number of the tracks on the record have this character: they start with a search for the undiscovered “center” of the improvisation, and through the sympathetic conversation that ensues, that center eventually reveals itself. And in the process, we get a seemingly endless series of shifting rhythms and textures, melodic fragments, and tempos, making for a stimulating and rewarding listening experience. Strongly recommended! Braxton really put Dresser and Hemingway through their paces for all those years in his quartet. Theirs is a connection I suspect won't ever fade.